A few months back we wrote a blog post on how to build an effective email popup to help you increase your email database. Since it proved popular, we thought we’d revisit this topic and give you some examples of great inspiring popups that we’ve seen around more recently. Before we go through the examples, I’d like to quickly go over why popups (used well) are so effective as tool to combat browse abandonment and increase your marketable database, and why you should consider implementing them. We all know how important it is for an ecommerce brand to create the best possible experience in their online store, and that this experience heavily depends on design, layout and relevance. The better the customer experience is, the more likely your visitors are to convert, to connect with your products, to identify themselves with you brand. But what does this have to do with email popups? Many would argue that email popups are annoying and frustrating, and that they push just as many visitors away as they retain. However, if well structured, designed and implemented, we believe that an email popup can be an almost seamless part of the visitor’s experience in your store and feel embracing rather than intrusive. You want visitors to want to sign up, to want to buy your products, to aspire to be a part of your brand - and to achieve this, creating an email popup that matches your brand voice entirely (design, tone, copy, UX, etc) can be just another helping step in nurturing these visitors. Reformation’s email popup is simply beautiful. With an irresistible design and minimalist structure (only requiring the visitor’s email, that’s it), the email popup appears on the website in a fluid, seamless manner, in line with the whole website feel. The copy of the popup - ‘Join the Reformation’ - is another essential element. 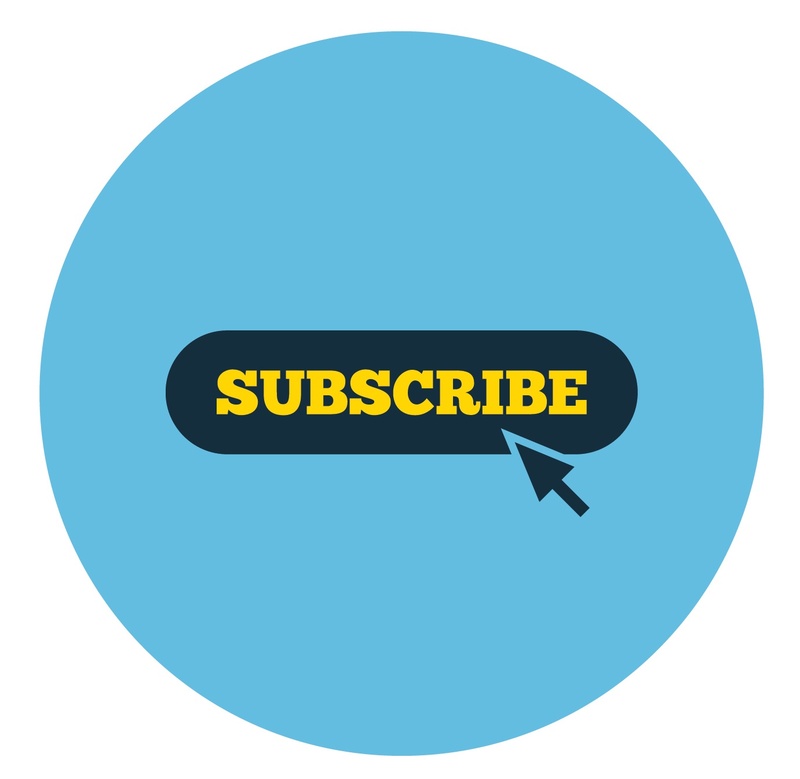 It entices the visitor to become part of a movement, to be a part of the brand, more than just subscribing to an email list. Like the previous example, AYR is a women's fashion brand with a super engaging popup that only requires one piece of information from visitors - their email. The title (and button!) in this popup is the most compelling element in our opinion - ‘Always first’ - this creates the feeling of exclusiveness, of being a member of a private club. Plus, they offer 20% off on first purchase - so all the more reason to sign up. We’ve mentioned earlier how important it is for a popup to match the personality of a brand, and we think House of Holland’s popup below is the best example at this. The copy is simply brilliant, and it is entirely loyal to their brand voice. They win around even the most spam-skeptical visitors by highlighting that they ‘promise not to abuse this trust and spam you with crap!’. House of Holland also only require visitors to leave their email address. What we love about Nasty Gal’s email popup is its non-intrusive appearance. The popup slides up at the bottom of the page without ever preventing you from viewing the main content you’re looking at. It’s a simple ‘Join the party’ invitation - and again we couldn’t resist signing up. This irreverent brand lets you sign up with your email or with Facebook, enabling visitors to sign up with a simple click. Again, this is a great example of a popup that matches brand tone of voice. French Connection is a particularly interesting example, as the company uses category-level segmentation on its popup. 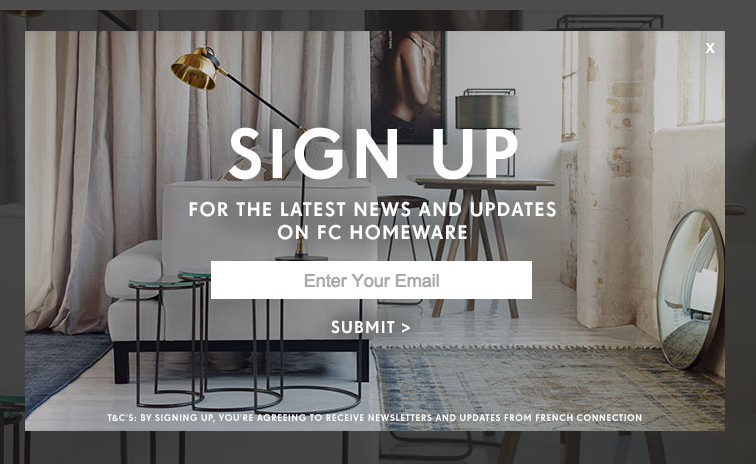 The homeware-themed popup below only shows if you visit the homeware category on the site, suggesting that French Connection are nurturing their homeware visitors/customers differently to their clothing ones. All visitors that show interest in this category will then be added to a specific list, which we assume will only be targeted with homeware-themed email communications. Another example of a non-intrusive popup is Pull & Bear’s below. The main image and content in the homepage remain fully visible, and the popup shows at the bottom right of the page. Not only is the website amazing - with sliding photos of their new collection worn by Instagram’s most popular couple - but the popup also refers to signing up and connecting to Pull & Bear. We believe this popup is very effective - while the homepage is doing all the ‘seducing’ (if we may call it that! ), the popup is the call-to-action to be the first to receive their latest news, the assurance that visitors will not miss a thing! The handcrafted cases brand opted for an offer in their email popup - ‘would you like 15% off your first purchase’ is the attractive element, and we like how the two calls-to-action are clickable (no immediate requirement to type in anything). Last but not least, Wool and the Gang has a great email popup that includes an offer with a sense of urgency. With a simple nice design, the messaging is clear - get 15% off but hurry! All they ask for in return is an email address, and they still reinforce the time limit below the sign up button. I hope you enjoy these examples as much as we do, and that you were able to find some inspiration and good ideas to create or improve your own email popup.